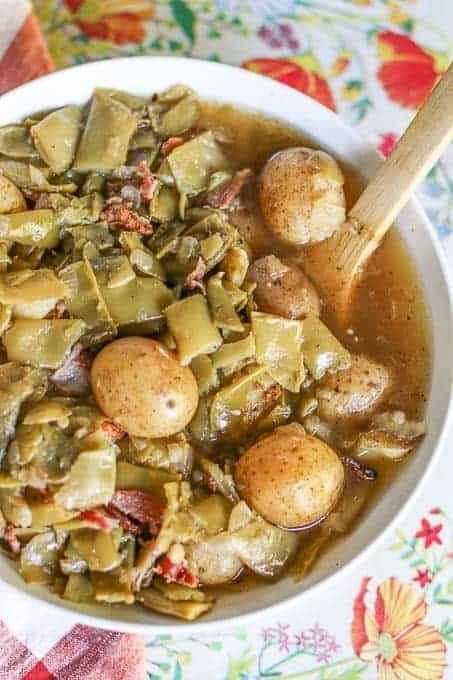 These Southern Crockpot Green Beans and Potatoes are seasoned with bacon for a delicious flavor. They are a perfect side to any meal and easy to make. In the South, we love to season our veggies with BACON! It gives them such a delicious flavor. 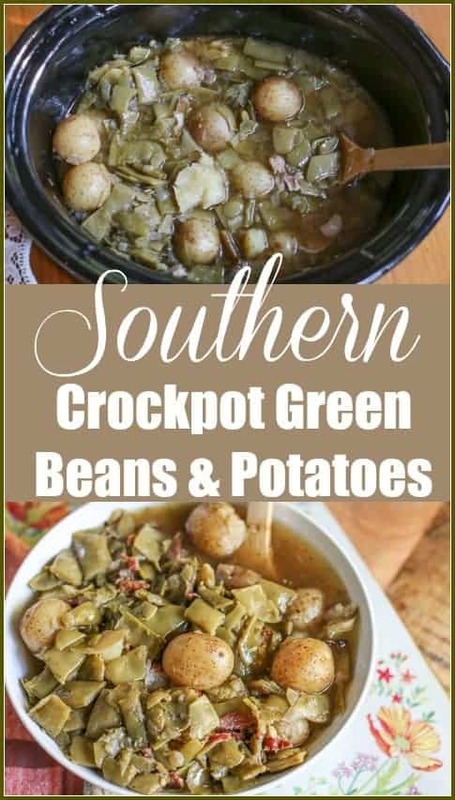 One of my favorite Southern sides is green beans with tender soft petite potatoes or new potatoes. I often make them with dinner, but I also make them at our cookouts when we are serving our pulled pork. There is nothing better than having Southern country sides with pulled pork. I have been asked for this recipe many times, and now I am FINALLY getting it up on the blog! Cook 4 slices of bacon. Reserve the cooked bacon and cook 1 onion in the bacon grease. Add 24 oz of little petite potatoes or new potatoes. Either way, use the really small cute potatoes. I leave the skin, but you can peel them if you want. Cut up 2 slices of raw bacon and mix in for extra flavor. Cook on low heat for 6 to 8 hours or until potatoes are soft and tender. Once cooked, crumble the cooked bacon and mix it in with the green beans. 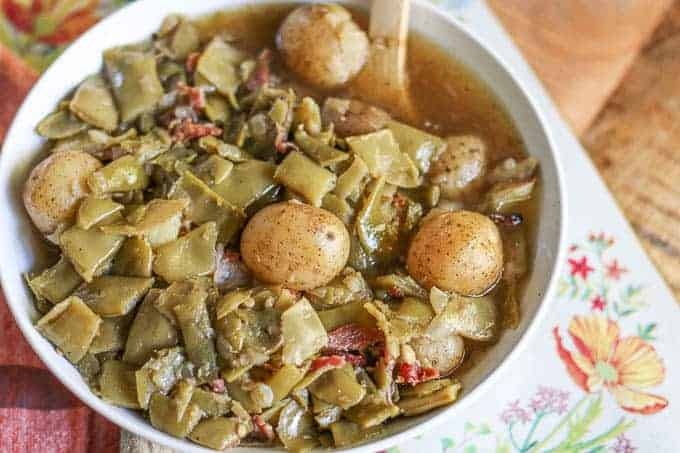 What other seasonings can you cook in with Southern Style Green Beans? I grew up using bacon grease and bacon to flavor our green beans. It really gives an amazing taste. I have also found that bacon is the easiest to cook with when cooking the green beans in a slow cooker. However, you can also use smoked turkey legs or wings, or ham hocks. Both of these will liven up those green beans into a rich, delicious side dish. Cook 4 slices of bacon. Reserve the cooked bacon. Cook onion in the bacon grease. Slice butter. Add to Crockpot. Add potatoes and green beans. Cut up the remaining 2 slices of raw bacon and add to green beans. Cook on low heat 6 to 8 hours or high heat 4 to 6 hours. It is done when potatoes are soft and tender. I love adding bacon to veggies too, especially green beans! It gives them so much flavour! Love the idea of adding small potatoes too! Need to try that! I am so happy! This is exactly the Thanksgiving side dish I have been looking for. There has been a surplus of green beans at the market lately, so I snatched some up. Bacon, potatoes, and some greens. It doesn’t get better than that as a side. Thank you for this! Bacon does make everything better I agree. I too like to use bacon with veggies that are “less loved” than most. Like Kale or brussel sprouts. This recipe of yours looks really hearty would be great even by throwing in a few meatballs so that you have a complete meal while out skiing for the day! 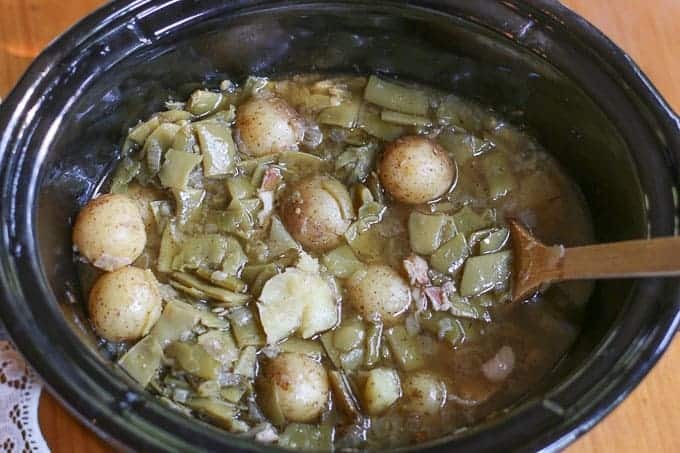 Crockpot meals are the best! I love the idea of adding the bacon to flavour this dish and it sounds perfect for cold winter days. Bacon goes so well with green beans and with potatoes! I think this is a brilliant side dish and I know I’d definitely be having more than one helping!